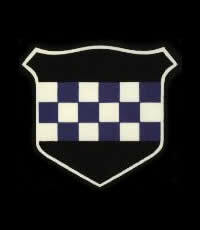 » Suicide Patrol, the story of BC Henderson, 394th Rgt. 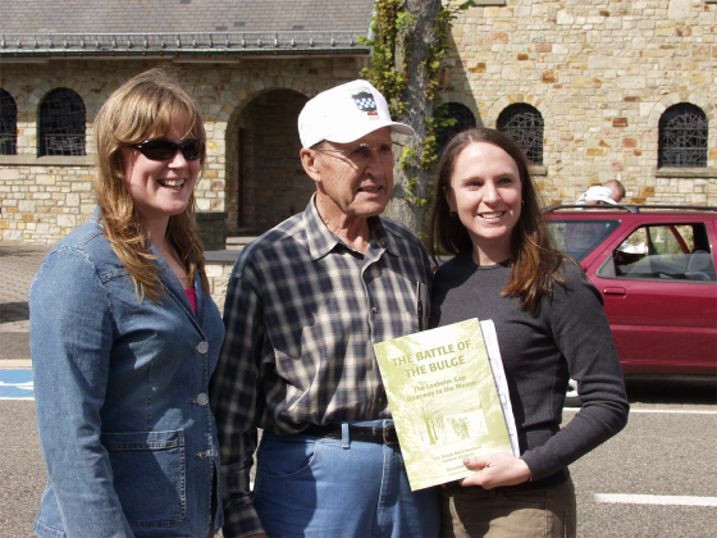 » From Buchholz Station to Elsenborn Ridge, the story of Don Wallace, 3rdBN 394th Rgt. » Medal of Honor recipient Vernon McGarity. 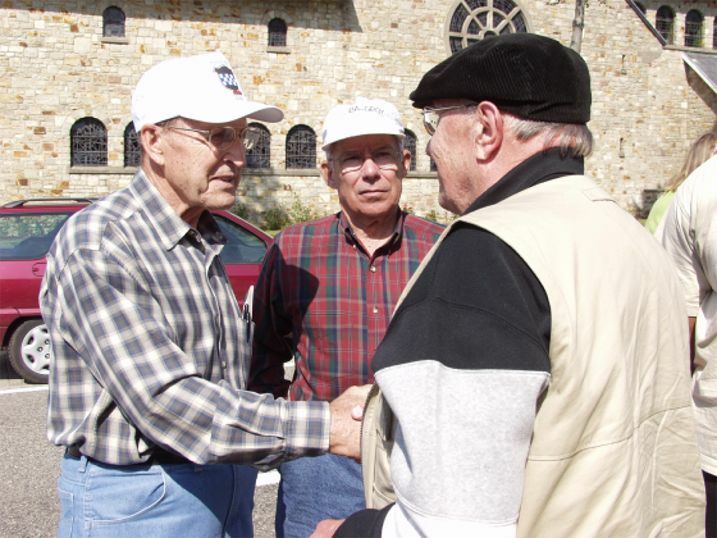 In Krinkelt veteran of the 99th Inf Div (left), J. Lawrence Apple, A Company, 393rd Inf Rgt meets up with (right) Rold Odendahl, veteran of the 1st Company, Fallschirmjäger Regiment 5, 3rd Fallschirmjäger Division. Mr. Apple just signed one of the books of a US Airforce member (right) who took part on that days Staffride from the WPC (Kaiserslautern). 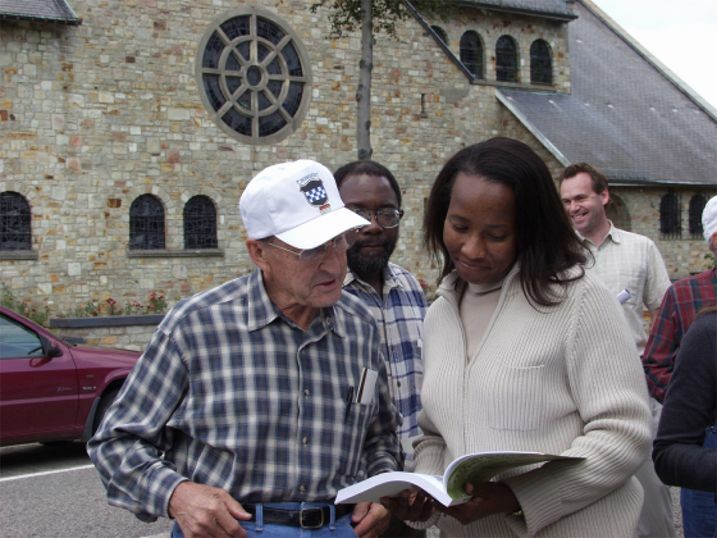 Mr Apple is looking together with a member of the US Airforce through the book 'Battle of the Bulge - The Losheim Gap', and points out where his position was. A completely green division, the 99th Inf Div had landed in France in November 1944; upon arriving in the Ardennes it was strung out along a 19-mile front, much of which was defended only by a series of strongpoints separated by large gaps. As the men of the 99th slowly learned the ways of war, they looked forward to December 16 when movie star Marlene Dietrich and her USO show were scheduled to perform on their behalf. The southern portion of the V Corps front was occupied by the 99th Infantry Division (Maj. Gen. Walter E. Lauer), which had arrived on the Continent in November 1944 and been placed in this defensive sector to acquire experience. The 99th Division front (left to right) extended from Monschau and Höfen to the railroad just north of Lanzerath, a distance of about nineteen miles. To the east lay the Germans in the West Wall pillbox line. The frontage assigned an untried division at first thought seems excessive, but the V Corps commander wished to free as much of his striking power as possible for use in the scheduled attack to seize the Roer dams; furthermore the nature of the terrain appeared little likely to attract a major German attack. In the extreme northern portion of the sector, around Höfen, the ground was studded with open hills, to the east of which lay a section of the Monschau Forest. Only a short distance to the south of Höfen the lines of the 99th entered this forest, continuing to run through a long timber belt until the boundary between the V and VIII Corps was reached at the Losheim Gap. The thick woods in the sector were tangled with rocky gorges, little streams, and sharp hills. The division supply lines began as fairly substantial all-weather roads, then dwindled, as they approached the forward positions, to muddy ruts following the firebreaks and logging trails. Except for the open area in the neighborhood of Höfen, visibility was limited and fields of fire restricted. Any clearing operation in the deep woods would only give away the American positions. Although terrain seemed equally difficult for defense or offense, this balance would exist only so long as the defender could retain control over his units in the woods and provide some sort of cordon to check infiltration. The nature of the ground and the length of the front made such a cordon impossible; the 99th could maintain no more than a series of strongpoints, with unoccupied and undefended gaps between. Three roads were of primary importance in and east of the division area. In the north a main paved road led from Höfen through the Monschau Forest, then divided as it emerged on the eastern edge (this fork beyond the forest would have some tactical importance). A second road ran laterally behind the division center and right wing, leaving the Höfen road at the tiny village of Wahlerscheid, continuing south through the twin hamlets of Rocherath and Krinkelt, then intersecting a main east-west road at Büllingen. This paved highway entered the division zone from the east at Losheimergraben and ran west to Malmédy by way of Büllingen and Butgenbach. As a result, despite the poverty of roads inside the forest belt where the forward positions of the 99th Division lay, the division sector could be entered from the east along roads tapping either flank. The dispositions of the 99th Division were these: On the north flank the 3d Battalion, 395th Infantry, occupied the Höfen area, with the 38th Cavalry Squadron on the left and the 99th Reconnaissance Troop on the right. The ground here was open and rolling, the 3d Battalion well dug in and possessed of good fields of fire. Next in line to the south, the 2d Division was making its attack on a thrust line running northeastward, its supply route following the section of the Höfen road which ran through the forest to the fork. The remaining two battalions of the 395th resumed the 99th Division front, succeeded to the south, in turn, by the 393d Infantry and the 394th. Conforming to the wooded contour, the elements of the 99th Division south of the 2d Division attacking column occupied a slight salient bellying out from the flanks.